Oakhurst Neighborhood Association, Fort Worth, Texas: Complete the ONA 2017-'18 Survey! Complete the ONA 2017-'18 Survey! We need your feedback! 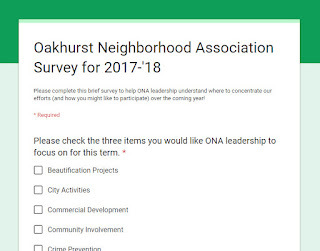 Complete the Oakhurst Neighborhood Association Survey for 2017-'18 by clicking on this link or the image below. Thank you in advance for your participation! July Oak Leaflet and ONA Activities! How did Oakhurst get its name? June Oak Leaflet Online Now!